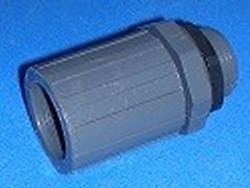 3/4" FPT Bulkhead fitting that swivels. Comes with one gasket. Good for thicknesses up to 1/8". Swivel means it turns while under pressure and won't leak. But it does not mean it spins. You have to apply a small force to turn it.